Instead of grams or kilos, diamonds are weighed in carats (not to be confused with gold’s Karat which signifies purity). This simply denotes a measuring scale where each 1 carat = 0.2 grams (0.50 carat = 0.1 gram and 5 carats = 1 gram). When comparing similar diamonds try to look at the measurements. Some diamonds with similar weights can vary significantly in measurements. Pick the one with wider measurements, and you will gaina larger diamond surface area for the same value. Dimensions play an important role in the appearance of a diamond. In addition to the carat weight, the distance across the top of the diamond must also be taken into consideration. A common misconception is that half a carat is half the size of one carat. 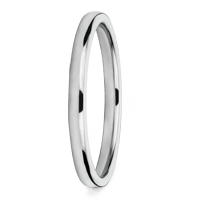 In fact, a half carat is half the weight of one carat, but the millimetre difference on a round stone is only 1.35mm. The average measurement for a 0.50ct stone is 5.00mm, while the average 1.00ct stone measures at 6.35mm. Download PDF guide here. 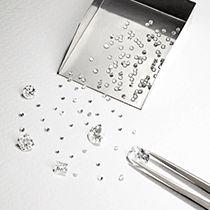 While carat weight may indicate a diamond’s size, the shape and cut of a stone also play a large part in determining how large or small the stone appears. 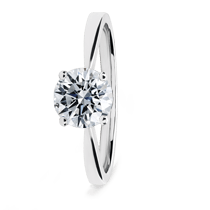 An elongated shape such as the Marquise cut may appear larger than a rounded shape such as the round brilliant even if the two stones share the same weight. To read about diamond shapes in more detail, please click here. When comparing two stones of the same shape however, it is important to look at the cut grades and table and depth percentages, as shallower stones will tend to appear larger than deeper ones. Other aspects such as girdle width can also affect how large a stone appears, while not necessarily affecting the quality of the stone. To read about diamond cut in more detail, please click here.